Salos have a track record of performance improvement using our unique tools and techniques to heighten performance delivery with bottom line results. Salos have a track record of ensuring operational excellence and delivering significant improvements for our clients. Using our unique performance improvement systems we are able to identify early project wins, transfer lessons learned, optimise the current operations and leave a legacy of high performing teams. In a recent short engagement our Better, Options, Measure Success approach helped our client realise $1M of savings in our first 3 suggested improvements. Salos continually seek to deliver significant performance improvements at the well site. Working closely with the onshore and offshore teams we provide our clients with the assurance of an efficient operation and optimum operational performance. Salos can identify and implement areas for improvement, in even the most mature of operations, even those that have a current optimisation focus. LEAD OpExcellence TM is a world-class operational performance improvement method grounded in our operational experiences of creating high performance teams. This involves initiating planning processes with management, office and field teams to commence the project with winning-outcomes in mind. Operational readiness reviews identify project needs and key areas for development, which are captured in a performance roadmap. 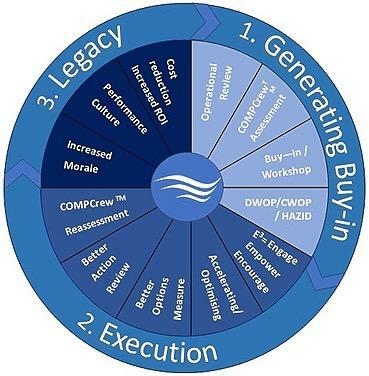 By engaging the teams to identify early project wins, such as in DWOP workshops, they are bought in to the process and have an ever increasing desire to perform. The execution of the continuous performance improvement process is the most vital stage of the OpExcellence Plan, Do, Measure, Act cycle. This stage involves training, coaching and mentoring the wellsite teams to drive performance by developing winning behaviours. Continuous performance improvement tools, such as Better Idea Goal™, encourage crew participation in achieving a winning outcome during every operation. By generating multiple improvements and removing “performance roadblocks” team members are more engaged and motivated, resulting in better operational performance, all of which result in lower NPT and reduced projects costs. Salos are able to deploy operational performance measurement tools that increase awareness of the overall team performance. This enables activity benchmarks to be created, improved on and NPT (and hidden NPT) to be significantly reduced. By creating continuous performance feedback loops the quality, quantity and consistency of actions is improved, thereby saving time and money. Salos provide 24hour performance support to the client’s operation utilising our unique Project-Asset Coaching System (PACS) and team. The target for this stage is to create an ongoing performance improvement culture so that future current operations and future projects can benefit through increased efficiencies and reduced drilling costs. Core to the delivery of the OpExcellence approach is the quality of our coaches and our extremely effective project-asset coaching system (PACS). Salos have an extensive range of training packages that we can deliver both at the worksite and at clients' offices. Our training approach is designed to maximise the engagement and understanding of those who attend. We use a range of training tools and techniques including mini-workshops, videos, case studies and simulations.